Before you start, you need to have a good basic knowledge of the sport. You’ll also need a good padded sledding harness and a gangline, which connects the rig to the dog. The kind of muching that you’ve chosen (whether sledding, scootering, bikejoring, skijoring or canicross) will determine the additional gear you’ll need. And of course, you must have at least one willing and capable dog! The key is fun and safety for both dog and musher. When introducing your dogs to the sport, try to find a handler to assist you with your dogs and get a ‘rabbit’ to bike in front of your team if they are still learning. This helps them to pull the line taught while chasing the ‘rabbit’. Dogs mentally and physically learn best as yearlings. This also gives their growth plates enough time to close (from 6-13 months). By starting training as a yearling you’ll minimize chances for injury as well as prolong your dog’s mushing career. A long distance for a young dog still training is 5km. You can gradually increase this distance by running 2 -3 times a week at most to condition the dog and slowly build up muscle memory. Dogs need to be conditioned to run and pull. At first, keep your distances short and quit while they still want more. Your stop or resting cue would be very important for this. 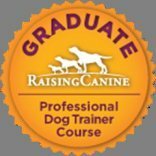 If your dogs are able to line out (to keep the gangline taught while facing forward) to do rest stops, you will be able to go a further distance. Sledding should always be done in cold temperatures as early as 6:00 / 7:00am so that temperatures are not higher then 15’C. Dogs can over heat very quickly. Things can go wrong very quickly while mushing with your dogs. If one gets hurt or scared once while mushing, chances are good that he/she will not want to run again. You need to make sure that each dog understands the basic commands. Your dog team need to learn cues like Gee (right turn), Haw (left turn), resting, hike, line out and a few more. When you run 4-16 dogs, your leaders in front listen for your directional cues which are very important. Then you get your swing dogs in the middle and your wheel dogs close to you. Each dog has an important place in the team. They are all connected with tuglines to the mainline/gangline. In bike-joring, scootering or carting, the gangline or mainline attaches to your bike or rig. 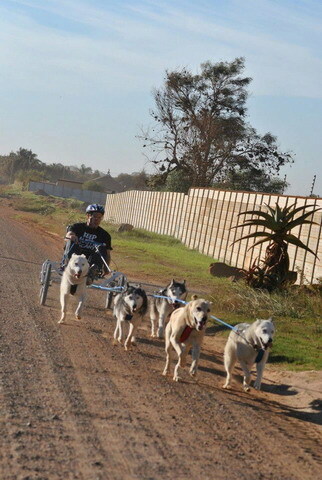 In canicross and ski-joring, however, the international standard has the gangline attached to the human harness or belt. This is a safety precaution to prevent your dogs from dragging you if you fall off (which is going to happen at some point!). It also prevents you from being pulled off your bike should the dogs make a sudden turn. Similar to real sledding, in scootering you can kick with the dogs as needed. When bike-joring, you will only peddle when needed – such as when going up hill. Bike-joring is different from biking with your dog. In biking, you peddle the whole time with your dog running next to you on a lead attached either to your waist or held in your hand. This is not part of sledding as the dog is not really pulling.